He’s classic, he’s timeless, he’s your beloved father. 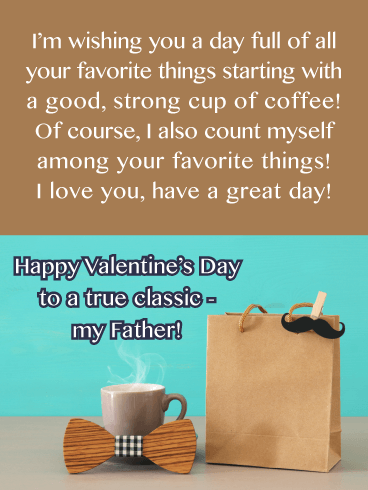 Featuring a simple, brown paper shopping bag, a large coffee mug, a bowtie, and a silly mustache decoration, this card has a bunch of these fun details that will appeal to your dear dad’s personal tastes! 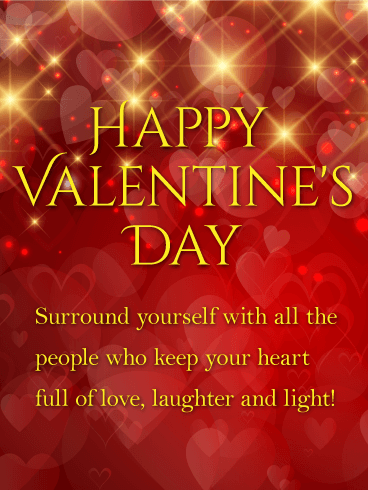 Send your amazing parent the True Class Happy Valentine’s Day Card and make his day! I’m wishing you a day full of all your favorite things starting with a good, strong cup of coffee! Of course, I also count myself among your favorite things! I love you, have a great day! Happy Valentine’s Day to a true classic -my Father! Roses and a puppy, it doesn’t get any better than this when it comes to special Valentine’s Day cards! Man or woman, young or old, everyone loves a cute puppy, and that’s why you can be sure your husband is going to just adore this greeting card. But of course, he will adore you even more for sending it his way! 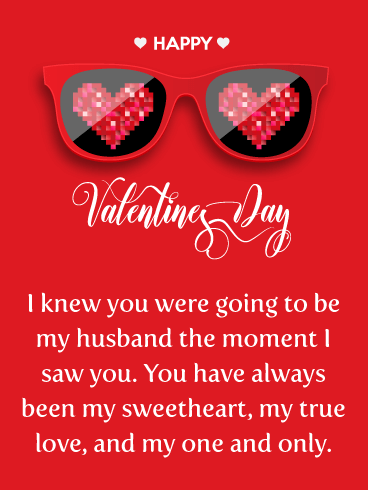 Give your husband a little laugh on this special day with this awesome Valentine’s Day card that will remind him of why he loves you so much! A cute robot takes center stage while holding a heart that represents your love. He will certainly smile as he reads that you were programmed to love him! 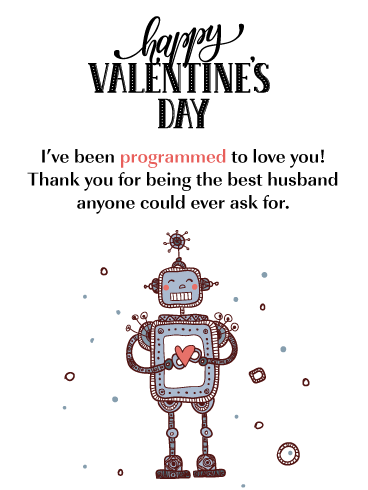 Send this little robot over to your husband, it will surely brighten his day! Nothing suits your darling dad quite like a…well, a suit! 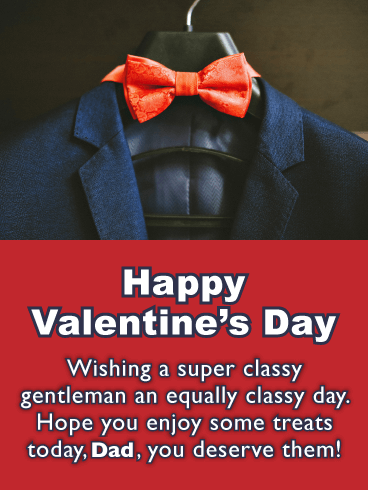 Charm the bowtie right off that dear father of yours by sending him the Sharp Dressed Dad Happy Valentine’s Day card. Warm his heart with a message complimenting his class and style. Put a smile on his face by letting him know you believe he deserves treats on Valentine’s Day too! Your dad is one of a kind, a true original. A super dad if you will, a child’s first hero! Growing up with him as a father guaranteed you always had someone to look up to and admire. 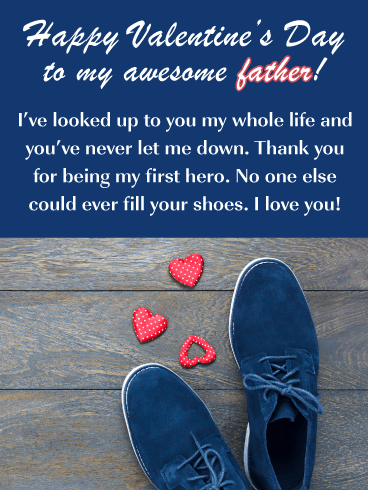 With the Big Shoes to Fill Happy Valentine’s Day card, you’ll be reassuring that dear old soul of how very much you love him. Send your wonderful father the ultimate card this year by choosing our elegant design featuring the highly-coveted title of World’s Best Dad! Delicious looking candy hearts gently decorate this simple black and red card, keeping it festive while still being plenty masculine. 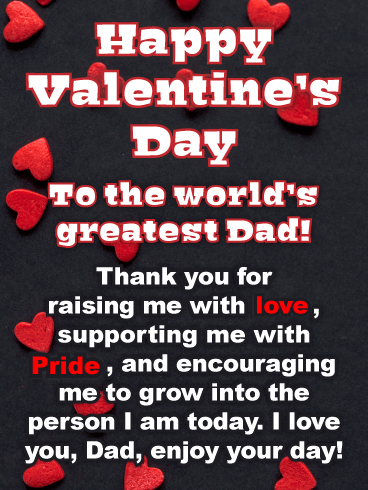 Thank your world class father for raising you well with the World’s Greatest Dad Happy Valentine’s Day Card! Does your husband have a clever sense of humor? If so, he will appreciate this Valentine’s Day card that features a play on words. If he is old enough, he will also enjoy the fond memory of his typewriter days! 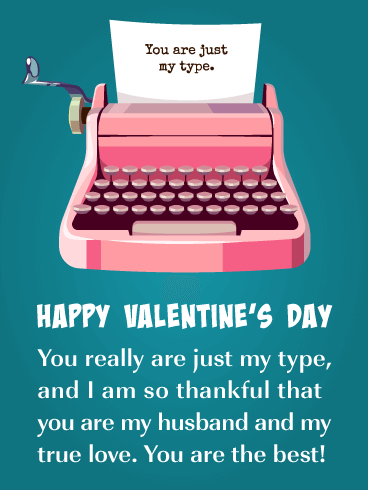 Let him know he is ”just your type” and also tell that he is your true love with this terrific Valentine’s Day card! Let dear old dad know he’s your kind of person this Valentine’s Day by sending him the You’re My Cup of Tea card! The classic teacup with a few small chocolates will warm his heart on this day of celebrating love. 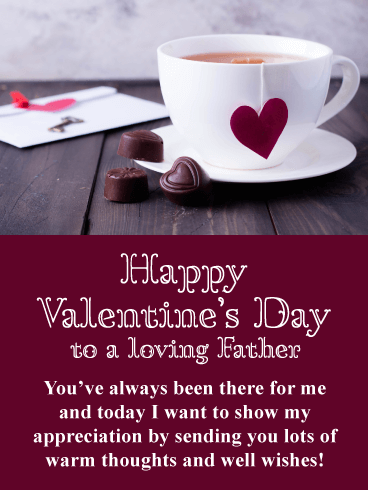 Your father has always been there for you, all throughout your life, and you wouldn’t dream of leaving him out when you send cards to all your loved ones! 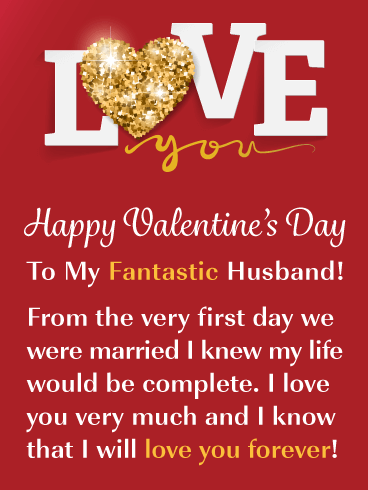 Send your fantastic husband a message of love with this wonderful Valentine’s Day card! It will make him appreciate you even more! A sparkling golden heart is showcased with the phrase “Love You”. This fabulous greeting card expresses that he makes your life complete and that you will love him forever. So special! 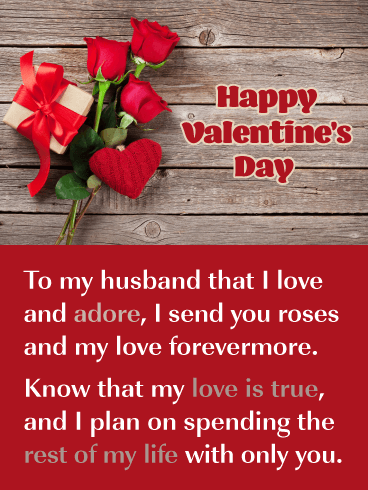 Warm your husband's heart today with this loving Valentine’s Day card made just for him. 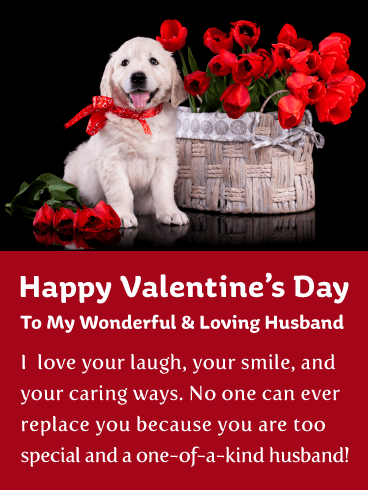 Send a truly romantic Valentine’s Day card to your husband this year, it will fill his heart with joy. He will love the roses and the gift, along with your thoughtful words of love. It doesn’t get any more romantic than telling your husband that you want to spend the rest of your life with him. So send this Valentine’s Day card on its way to let him know how you feel about him today! If you were one of those lucky couples that experienced ”love at first sight”, then this is the Valentine’s Day card for you! Your husband will fall in love with you all over again when he sees this romantic and cute greeting card. It features a fabulous pair of sunglasses with special hearts that represent your love for him. 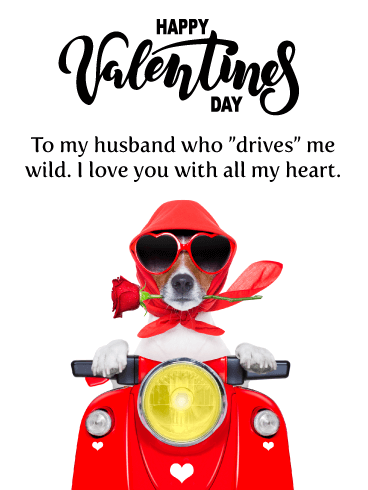 Send your husband this Valentine’s Day card today so he can see that you love him in every way!